LePage Reneges on $100M Statewide Maine Jobs Bond Contracts, Day 3: MaineDOT Projects in Peril? We are giving Governor LePage a pass on the “Day Count” for Saturday and Sunday, as he was down in DC for the NGA winter meeting… well, until yesterday morning at least. 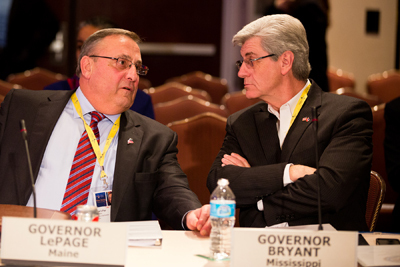 Feb. 22—Maine Governor Paul LePage and Mississippi Governor Phil Bryant at the Homeland Security & Public Safety Committee session, which was about the future of the National Guard (photo via NGA). He inexplicably skipped last night’s dinner with President and Mrs. Obama at the White House, as well as multiple meetings today with the President and Vice-President Biden. Hey, waitaminute… Anyone else remember when LePage pulled out of NGA? LePage said he will attend the winter meeting, held in Washington, D.C., because of its sessions with President Barack Obama and cabinet members. But he said he has no use for the other meetings held by the group. …governors from both parties report that a full repeal of the law (ACA) would be complicated at best, if not impossible, as states move forward with implementation and begin covering millions of people – both by expanding Medicaid rolls for lower-income resident or through state or federal exchanges that offer federal subsidies to those who qualify. A recent Associated Press analysis of the sign-ups found that six Republican-led states –Florida, Idaho, Maine, Michigan, North Carolina, and Wisconsin – were on pace or better than the states had initially projected. Last August, Maine Governor Paul LePage recorded a video, urging support for a $100 million transportation bond as a means of “supporting economic development and jobs”. It was a politically motivated plea sent out directly at the public for a solitary transportation bond to be put on the November ballot. He also called for a special session and once the dust settled on that special session called for by the Governor, there was agreement on a slew of bonds to go before voters. Question 4 (Maine Maritime Academy Science Center bond), that last taken up on Friday’s Day 2 post. Voters in November passed all four of the above bonds by wide margins and as the Secretary of State’s office“Citizen’s Guide 2013″ points out, all passed measures go into effect 30 days after the election results are certified. 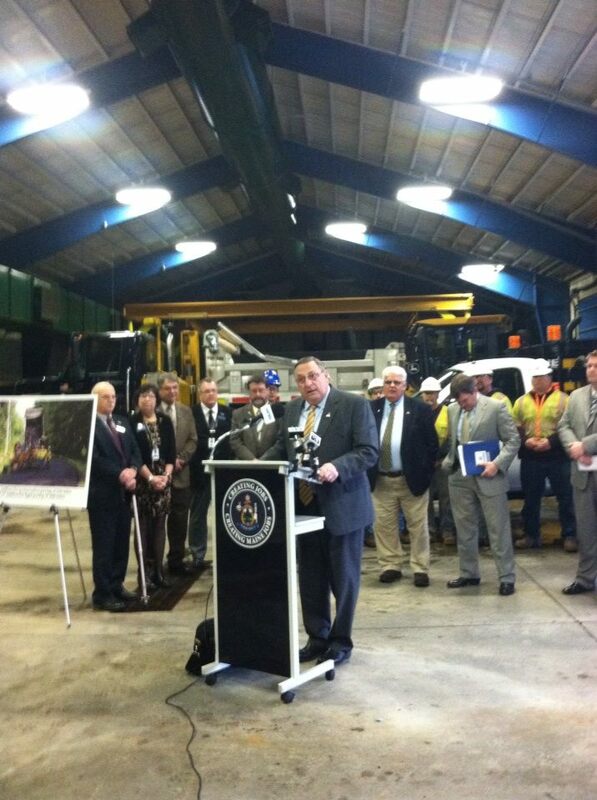 Governor Paul LePage and MDOT Commissioner David Bernhardt release 3 year statewide Work Plan in North Augusta. The Maine DOT’s “Three Year Work Plan” will use $100 million in state transportation bonds – approved last November by voters – and federal highway funds to pay for more than 1,600 projects from now until 2016 in all 16 of the state’s counties. In 2014, a total of 425 projects are scheduled at a cost of $455 million. As there was quite a bit of ongoing bickering over the budget, revenue sharing, the infamous Alexander Report and Medicaid expansion a few miles away at the State House, media questioned the Governor after the presentation about those topics instead of the MDOT work plan. “It’s just the opposite of what the opponents say. Let me tell you something… I hear, Mark Eves says… (unintelligible) “tea party guy”… it takes one to know one. When I was a Democrat… I was a Democrat- until- I learned how to count. You see that? I learned to count; I became a Republican. Because they’re giving you smoke and mirrors. They gave us smoke and mirrors in 2002 and they’re doing it again today. … and that he has “no power” with this legislature, among other claims. So at no time in January did the Governor publicly threaten to renege on the transportation bond. In fact, on the following day (January 15), his weekly address stressed that “Maine has an obligation to help our most vulnerable and pay its bills”. The work will provide badly needed jobs in Maine’s construction sector, where as recently as early last year, says Matt Marks, unemployment topped 26 percent. Marks is executive director of Associated General Contractors of Maine. “Last year, I worried about the talented constructors who would leave Maine for jobs in other states,” he said. But Marks says unemployment among his membership has now dropped to 16 percent, a downward trend he expects will continue, as the 2014 transportation projects get under way this spring. The Transportation Department says it’s confident it will secure the state and federal funds it will need to complete the more than 1,000 projects scheduled for 2015 and 2016. Here is the list of contracts awarded so far, updated as late as February 14. It will be interesting to see how they react to news of the Governor’s refusal to honor the state’s signed contracts and whether the work already scheduled will be able to continue.